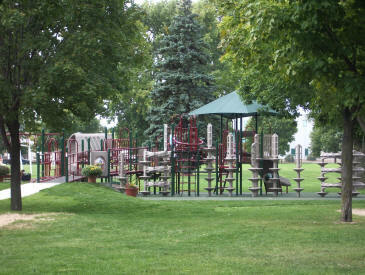 October 2007 -- The Fond du Lac Evening Lions donated $2,500 towards the new barrier free playground built at Lakeside Park in Fond du Lac. 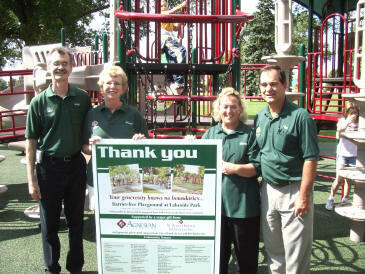 The playground was the project of the Leadership Fond du Lac team for 2006-07 which is sponsored by the Association of Commerce. The playground will allow children with limited mobility to have access to playground equipment like other kids. Lions Clubs International suggests that Lions Clubs partner with other organizations to accomplish large projects that Lions can not complete by themselves. 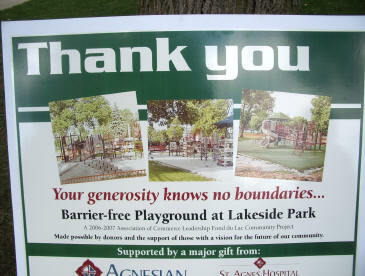 Agnesian Healthcare made a major gift which ensured the project's success. 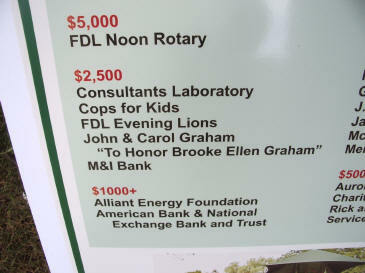 The Chris Reeve Foundation was also a major donor along with the Fond du Lac Noon Rotary Club. Pictured at the dedication ceremony are PDG Gary Colton, Elaine Colton, Betty Clausen (president when donation was awarded) and PDG Tom Clausen.